VATICAN CITY -- Canadians are anxious to reconcile with Indigenous Peoples, Justin Trudeau described telling Pope Francis on Monday as he asked the pontiff to apologize for the role the Catholic Church played in the tragedy of residential schools. The Pope -- himself no stranger to the cause of social justice, he noted to Trudeau -- seemed open to the idea, the prime minister said as he related the broad strokes of their private conversation at the Vatican. "He reminded me that his entire life has been dedicated to supporting marginalized people in the world," Trudeau said after he arrived back in Rome. Pope Francis also expressed his enthusiasm for working with the prime minister and the Canadian bishops on finding a way forward on the issue of an apology, as recommended by the Truth and Reconciliation Commission. The commission included the demand for a papal apology -- to survivors, their families and communities -- as one of the 94 recommendations in its report on the dark 120-year history and tragic legacy of residential schools. Trudeau, who has promised to act on each recommendation, had previously committed to speaking to the Pope about an apology, but pointed out he could not compel the pontiff to agree. On Monday, Trudeau said he invited the Pope to visit Canada in the coming years, and thanked him for the global leadership he has shown on climate change. "We talked about how important it is to both highlight the scientific basis of protecting our planet, with the moral and ethical obligation to lead and to build a better future for all people on this earth," he said. Trudeau, a religious Catholic, suggested the meeting gave him some spiritual fulfillment. "I also had an opportunity to have a deeply personal and wide-ranging, thoughtful conversation with the leader of my own faith." Just before 12:30 p.m., the media was ushered in to the Pope's private quarters, then quickly hustled out. At 1:04 p.m., a bell rang, signalling the end of Trudeau's private audience. 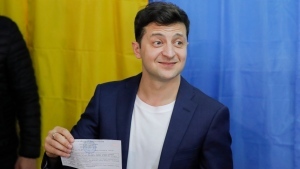 The Prime Minister's Office called it a 42-minute meeting. U.S. President Donald Trump, who like Trudeau had been in Brussels for the NATO leaders' meeting and in Sicily for the G7 summit, met the Pope for about 30 minutes last week. 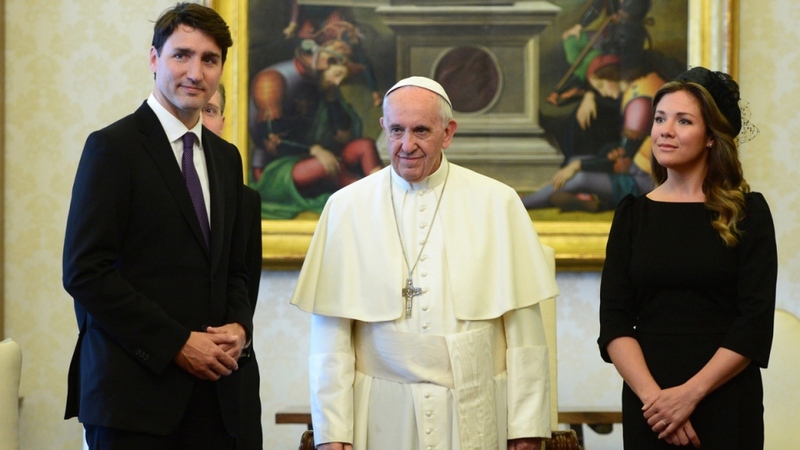 Afterward, Trudeau introduced his wife, Sophie Gregoire Trudeau, to the Pope along with officials from the PMO. The prime minister presented the Pope with a dictionary in French and Montagnais -- spoken by the Innu people in Labrador and northern Quebec -- written by a French Jesuit in the 17th century. Pope Francis, through an interpreter, said it was the custom of Jesuits to produce such dictionaries when they travelled, to enable them to communicate with local communities. 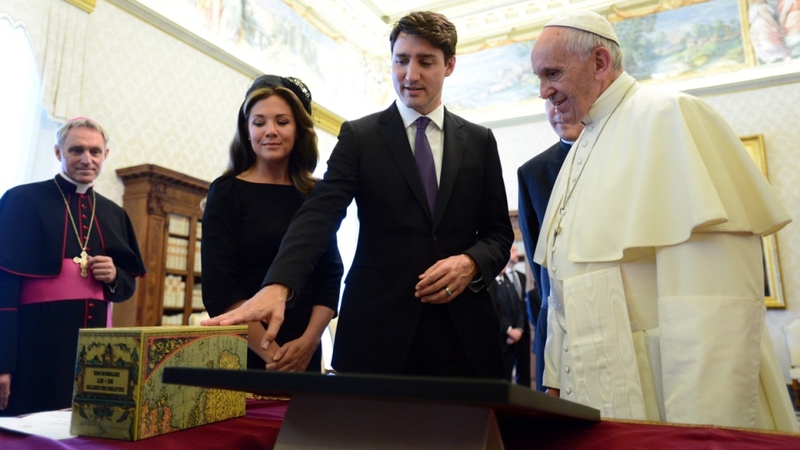 The prime minister also gave the Pope a set of books known as the Jesuit Relations, which Trudeau called "an essential tool for historians to understand the early years and stories of Jesuit missionaries documenting the origins of Canada." "This is a rare edition that we got from the Jesuits in Canada," he said. In return, the Pope gave the prime minister a gold medal marking the fourth year of his pontificate, an autographed copy of his message for World Peace Day and three papal letters about family, the environment and evangelism. A readout from the PMO described "an extended conversation" on the need for leadership on issues like climate change and mass migration, and a discussion about stronger relations between Canada and the Holy See. A statement from the Vatican said that in light of what came out of the G7 summit, their "cordial" discussions also touched on international issues, particularly the Middle East and areas of conflict. In 2009, former pope Benedict did express "sorrow" on behalf of the Catholic Church for the "deplorable conduct" by some members in their treatment of indigenous children in residential schools. Not good enough, said the commission, especially since it was not made in public, recommending an apology similar to one Benedict delivered in Ireland in 2010 to victims of abuse by the church. Perry Bellegarde, national chief of the Assembly of First Nations, said he remains hopeful the Pope will come through with a formal apology. "Pope Francis has a lot of influence on world thinking and is a very, very popular pope," Bellegarde said. "He's a very influential individual and to have him come would be a ... huge undertaking on that road to reconciliation." NDP indigenous affairs critic Romeo Saganash, a residential school survivor, dismissed the issue as a "public relations stunt" that would do nothing to help indigenous communities wracked by housing, clean water and suicide crises. On Tuesday, Trudeau will continue his official visit to Italy, where he will meet Prime Minister Paolo Gentiloni and deliver an address to parliamentarians. Trudeau is promoting cultural and economic ties between the two countries, including the Comprehensive Economic and Trade Agreement between Canada and the European Union. A spokesperson said Trudeau had a private drink with former prime minister Matteo Renzi on Monday evening. In April, Renzi regained the leadership of the Democratic Party.